I’ve been testing the 2018 Babolat Pure Drive Tour Plus lately and wanted to write and record a review of this powerhouse of a tennis racquet. 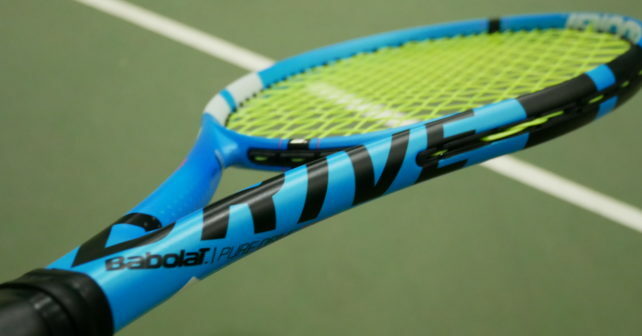 So…this is the Tennsnerd review of the Babolat Pure Drive Tour Plus. So what is the Babolat Pure Drive Tour Plus? Well, it’s the beefed-up and extended version of the standard Babolat Pure Drive (which I review here). The Tour Plus version is 315 grams unstrung instead of 300 and the extended length brings it up to 27.5 inches. This increases the swing weight to 328 which can be a bit cumbersome for some, but compared to previous versions of this racquet I feel it swings easier. 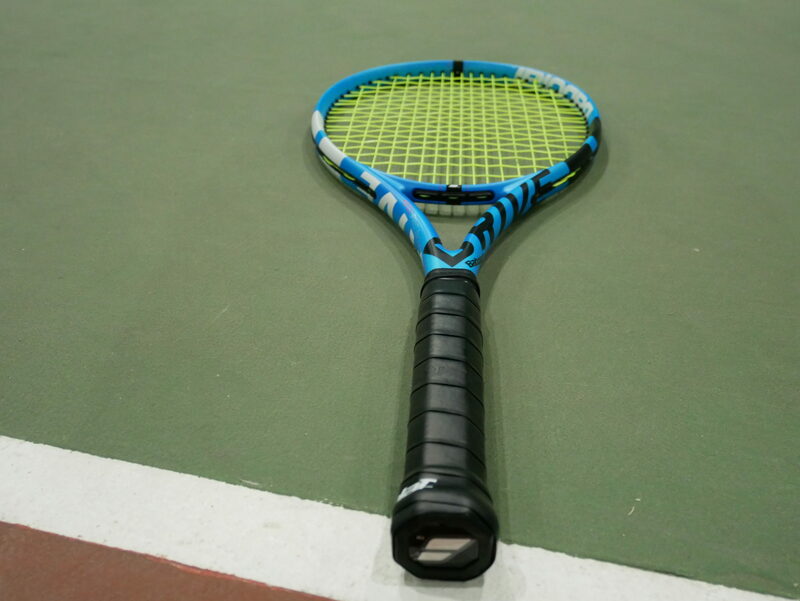 Obviously, an extended racquet isn’t for everyone, but I think it’s definitely a good idea to try one if you haven’t done so before and the Babolat Pure Drive Tour Plus is a great place to start. Let’s look at the different factors of this racquet. What’s new between the previous version and this 2018 one? Well, something Babolat calls FSI Power which features diamond shaped grommet holes and wider string spacing. Does this work? Yes, this edition of the Pure Drive actually provides more spin on your shots which frees you up to swing a bit more freely. The extra spin is definitely needed since this stick doesn’t run low on power! Another addition to the 2018 edition of the Babolat Pure Drive Tour Plus is the Cortex Pure Feel which is a viscoelastic rubber material for a more muted and comfortable feel. You will notice the Cortex Pure Feel in the small wart-sized dots on various areas of the frame. Does this increase the comfort level which has always been somewhat of an issue with the stiff Pure Drive racquets? I think also the extra weight of the Tour version compared to the standard Pure Drive contributes to the comfort since the racquet is more stable and won’t suffer from the same vibrations as the lighter racquet. Needless to say, the new Babolat Pure Drive Tour Plus packs a massive punch with 71 RA, 328 swing weight and 330 grams strung. I often felt like I just needed to put my racquet on the ball and the ball would reach the other side of the court with decent depth. This power must be harnessed however and being able to whip this racquet around for more top spin is required to really use it effectively. If you do play a flatter game with a slow swing speed, it might also work fine, but it is by no means a racquet for precision and touch – if that is what you’re looking for, I’d definitely suggest you check out the Prince Phantom Pro 100P (read my review here). However, the Pure Drive is not a bad racquet to volley with as it is stable and provides good and direct feedback on short swings. It’s also an absolute beast to serve with and I don’t think I’ve ever hit harder practice serves with a racquet before. The ball just explodes of the string bed and makes you wonder if you’re the new, significantly shorter version of Ivo Karlovic. So what you get with the Babolat Pure Drive Tour Plus is an addictive level of power that makes tennis sometimes feel like cheating. I usually like to put in an effort with each shot (sounds weird, but I like to work hard since tennis is supposed to also be exercise) and that’s possibly why I gravitate towards low-powered control racquets, but with the Pure Drive you can direct shots with pace easily and you can hit some blasting winners that you probably wouldn’t even try with a racquet like the more flexible Prince Phantom. This comes at the cost of control and touch, but if that’s a trade-off you’ll take because it works well for your game, I have no hesitation in recommending the new Pure Drive Tour Plus (or Pure Drive Tour ). I must actually commend Babolat for actually making a meaningful improvement to this frame and for not muting the feedback of the racquet too much, while still making it more comfortable to play with. Below you have the specs for the racquet. Make sure to follow us on YouTube, Facebook and Instagram. And as always, thanks a lot for reading Tennisnerd.